It started with Benjamin from Geronimo Stilton. Firstborn got the idea from him that he wants to travel and write about places and things he sees. Upon hearing from him his desire to write, Gladwell’s “concerted cultivation” concept immediately took an active part in me again. I began to encourage him. And so, when I learned about Whatthebook’s Saturday book reading and book signing by new children’s book author Darren Farrell, I immediately signed up my 2 boys. It was a good chance for them to meet a writer and see what he does. 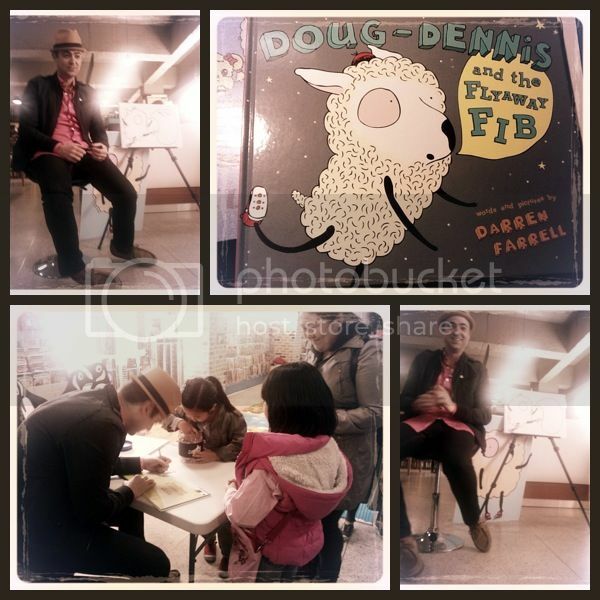 Aside from reading from his book Doug-Dennis and the Flyaway Fib, the author also entertained the kids with Doug-Dennis illustrations. It was short, barely an hour, but me thinks it was a good way of cultivating kids’ interests, especially when I know that they have shown an inclination to writing (by “they,” I mean even the little one is following his Kuya’s declaration that he also wants to be a writer). Oh, kids! They could be anything they want at any day they choose. “I use my imagination, Mommy!” as my son Second-born always declares!